I woke up early the other morning and wanted to be active, so I hopped online and searched for “Hikes Close To Seattle.” There were plenty of awesome options on the list, but with cascading waterfalls and old growth fir trees, the Twin Falls trail in North Bend was hard to resist. 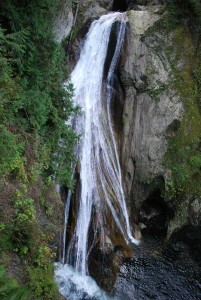 Located in Olallie State Park (a Discover Pass is required), the Twin Falls trail is only 45 minutes from Seattle. It’s a bit hillier than I expected, but the hike is great for all ages. I saw seniors, children, and everyone else in between on the path. 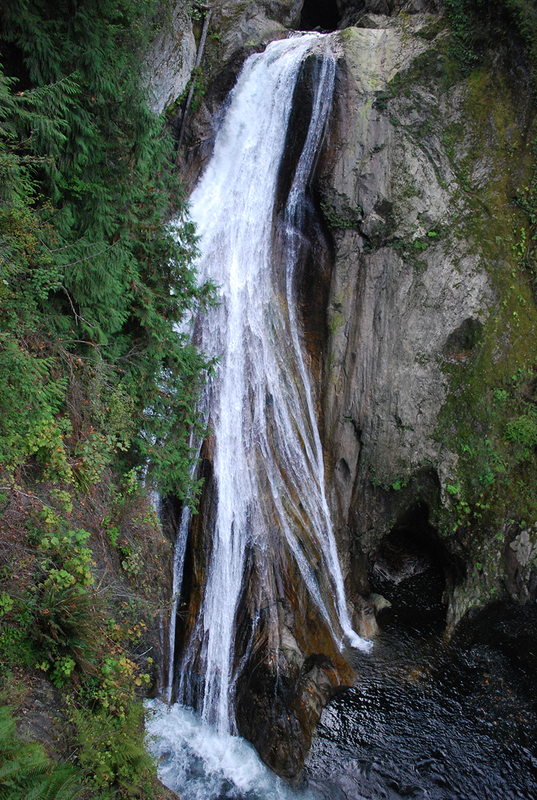 Here’s how you find the Twin Falls trailhead from Seattle: Drive east on I-90 to exit 34. Take a right turn off the exit on 468th Ave SE. After about a half-mile, turn left on SE 159th St. That road leads you directly to the parking lot for the Twin Falls trail. 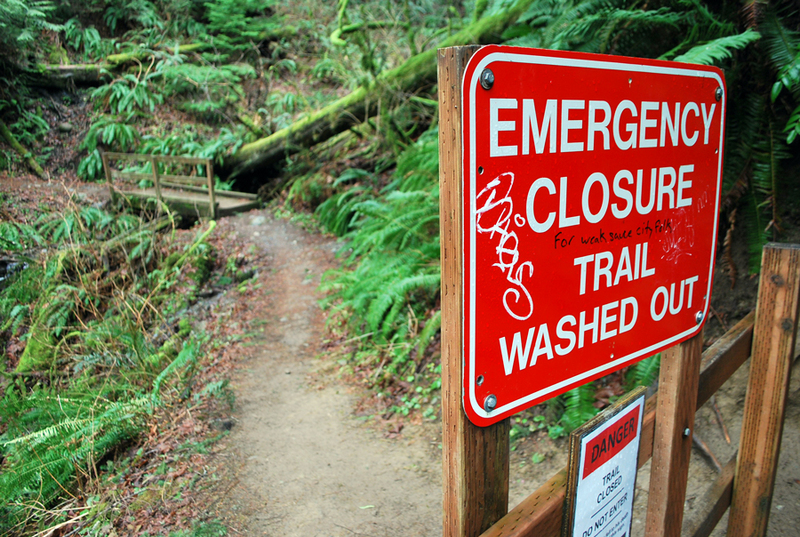 IMPORTANT NOTE: The normal Twin Falls trail is closed (and has been for more than a year now) due to dangerous conditions. 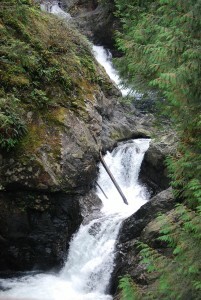 You can still access the Twin Falls by starting your hike at the Homestead Valley Trailhead. 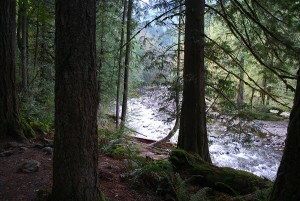 Hike up to the Iron Horse Trail from the parking lot, and then follow the signs to the Twin Falls trail. The round-trip is about 3.5-miles. 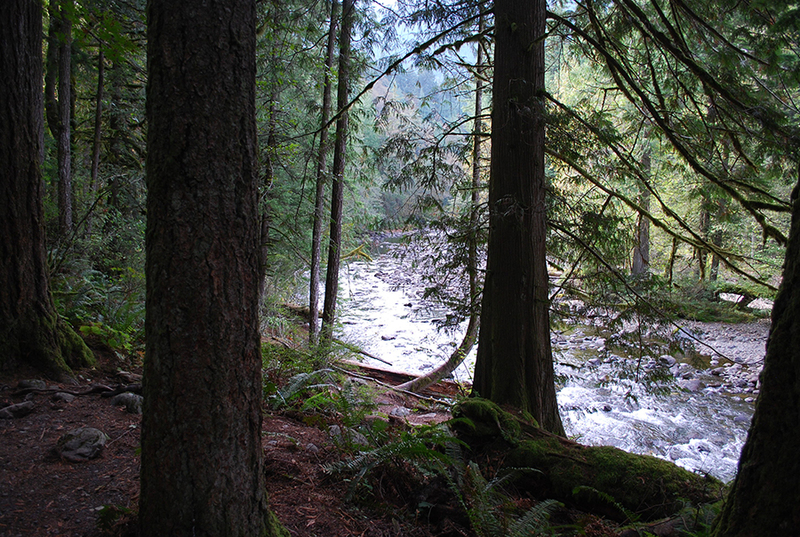 The Twin Falls trail starts and ends (since most people treat this as a there-and-back hike) along the South Fork of the Snoqualmie River. 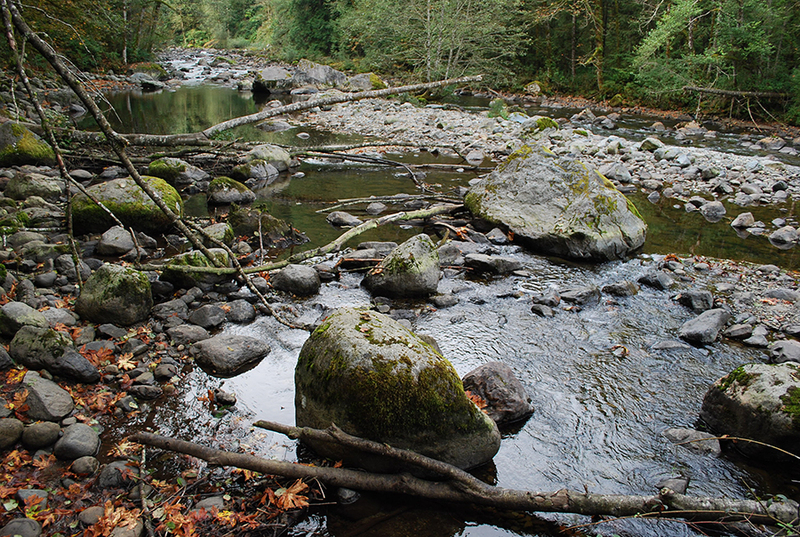 There are several swimming holes along the path, which are perfect for a dip on a hot summer day. You eventually leave the riverside on the Twin Falls trail and start a zig-zag, uphill climb through a moss-covered forest (there’s about a 500-foot elevation gain along the way). A little less than a mile into the hike is your first view of the 150-foot Lower Twin Falls. There’s a small viewpoint (a bit obstructed by growing trees) with benches. It’s a nice stop, but the views of the falls get much better deeper into the hike. After the viewpoint, you start to head downhill on the Twin Falls trail. 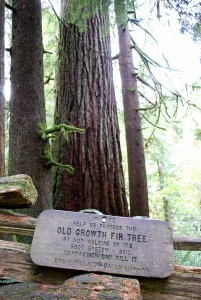 The hike then leads you past a massive old growth fir tree. According to Everytrail.com, the tree is more than “32 feet around the base of its trunk (10 feet in diameter) and is estimated to be between 400 to 700 years old.” The gigantic fir is protected by a small wooden fence, and you’re asked to not get near the tree to help keep it alive. Even though you can’t get too close to the tree (no hugging), it’s still really amazing to look at. The Twin Falls trail continues back uphill to the waterfalls. As you reach the top of the hill (a little more than a mile from the start of the hike), you’ll notice a stairway to the right that leads down to the Lower Twin Falls viewpoint. There are more than 100 steps, but this is a MUST. It’s easily the best view you’ll find of the falls on the hike. After you make your way back up the stairs, the Twin Falls trail leads you down to the Twin Falls bridge. The short wooden bridge takes you across a canyon over the Lower Twin Falls and below the Upper Twin Falls (your first glimpse of the upper falls on the hike). This is where a lot of people turn around, but I urge you to continue just a little more. Across the bridge, you then climb a few more feet to another Upper Twin Falls viewpoint. Yes, it’s uphill (again), but it’s worth seeing the upper falls in all their glory. The Twin Falls trail keeps going from there (without any more views of the falls), eventually connecting with the John Wayne Pioneer Trail (a rails to trails path that leads from North Bend to the Columbia River). I walked a quarter-mile or so past the final viewpoint, but then I turned around to head back to the trailhead. I did the Twin Falls hike early on a Friday morning in mid-September, so I was all by myself on the trail for a while. But, that honestly didn’t last long. The Twin Falls trail is really popular (because of its ease and views), so I passed several groups of hikers on my way back down the trail. I was one of two cars in the parking lot when I first got to the trailhead, but the lot was full by the time I was done. I suggest going early in the morning to avoid the crowds (if you’re looking for some serenity). There are a bunch of awesome hikes near Seattle, but the Twin Falls trail has to be one of the best all-age adventures. It’s only about three miles roundtrip, but the path is loaded with really cool scenery. It’s a nice, little escape from city life. You can be on the trail and back to Seattle within a few hours (if you really want to be). Have you ever hiked the Twin Falls trail? How do you rate it compared to other hikes near Seattle? We’d love to hear from you, especially if you have other cool trail suggestions. Please leave your comments below or connect with us on Facebook, Twitter and Google+. Don’t forget to also check out Seattle Bloggers for more fun activities around Western Washington!